I have always had a strong affinity to eastern music traditions and have already been to India to study rhythmic patterns. Recently I was confronted with the music of the Greek/Armenian mystic G.I. Gurdjieff, which he composed in collaboration with his pupil Th. de Hartmann. As an immediate reaction to the stunningly beautiful, yet ambiguous and somewhat mysterious music, I composed the three chants for Violoncello solo. The thematic material of the piece is derived from the Gurdjieff / de Hartmann compositions "Armenian Song" and "No.11". There is a cello arrangement of "Armenian Song" included, which is to be played as a prolog to the three chants. 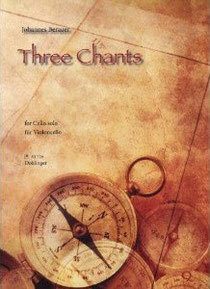 The three chants are a gradual approach from West to East, both musically and philosophically. The music changes from chaotic, frantic, loud to a deeper, calmer, more peaceful music, always referring to the material of the above mentioned Gurdjieff pieces. This approach is resembled in 3 different tunings of the cello. The retuning of the strings can be seen symbolic for fine-tuning the human soul, which was Gurdjieffs main intent. The first chant uses the standard tuning C-D-G-A. It is not very defined in terms of tonal center and holds many possibilities. The second tuning C#-G#-d-a comprises two tonal centers and therefore holds great ambiguity, acting somewhat as a bridge between departure and goal. The 3rd tuning D-A-d-a is clearly centered in D and lends itself very well to modal drone centered music. "Johannes manages to connect 21st Century innovation with Jazz music to great success. I see a long and productive musical life for him -- very, very gifted."